Abstract: Patients with breast cancer may be at an increased risk for infection due to their immunosuppression. Anywhere from 2-24% of breast cancer patients suffer from infections caused by microorganisms, usually diagnosed following expander related reconstructive surgery. Tissue expander surgeries may develop complications that can often result in extending antibiotic treatment, increasing the rate of drug related complications, and removal of the implant. 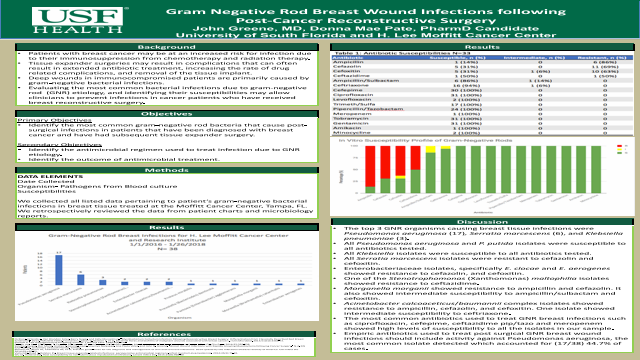 Deep wounds in immunocompromised patients are primarily caused by gram-negative bacteria. Evaluating the most common bacterial infections due to GNR etiology, and identifying their susceptibilities may allow clinicians to prevent infections in cancer patients who have received breast reconstructive surgery. Since most available research is focused on evaluating and isolating gram-positive bacteria such as S. Epidermidis and S. aureus, the primary objective of this study is to identify the most common gram-negative bacteria that causes post-surgical infections in patients that have been diagnosed with breast cancer and have had subsequent tissue expander surgery. Once the most prevalent types of gram negative bacteria have been identified, the secondary objective will allow evaluation of current antimicrobial regimens. This will, in turn, pinpoint both effective and ineffective treatment plans due to resistance and susceptibility changes. Identifying outdated and effective therapy regimens may contribute to lowering the incidence of deep-seated postoperative infections; to determine if the current protocol treatment regimens at Moffitt is concurrent with positive surgical and post-surgical outcomes. This will allow us to objectively assess which antibiotics are both effective and ineffective against current strains of gram-negative bacterial infections. •The top 3 GNR organisms causing breast tissue infections were Pseudomonas aeruginosa (17), Serratia marcescens (6), and Klebsiella pneumoniae (3). •All Pseudomonas aeruginosa and P. putida isolates were susceptible to all antibiotics tested. •All Klebsiella isolates were susceptible to all antibiotics tested. •All Serratia marcescens isolates were resistant to cefazolin and cefoxitin. •Enterobacteriaceae isolates, specifically E. clocae and E. aerogenes showed resistance to cefazolin, and cefoxitin. •One of the Stenotrophomonas (Xanthomonas) maltophilia isolates showed resistance to ceftazidime. •Morganella morganii showed resistance to ampicillin and cefazolin. It also showed intermediate susceptibility to ampicillin/sulbactam and cefoxitin. •Acinetobacter calcoaceticus/baumannii complex isolates showed resistance to ampicillin, cefazolin, and cefoxitin. One isolate showed intermediate susceptibility to ceftriaxone. •The most common antibiotics used to treat GNR breast infections such as ciprofloxacin, cefepime, ceftazidime pip/tazo and meropenem showed high levels of susceptibility to all the isolates in our sample. •Empiric antibiotics used to treat post surgical GNR breast wound infections should include activity against Pseudomonas aeruginosa, the most common isolate detected which accounted for (17/38) 44.7% of cases. Summary: Patients with breast cancer may be at an increased risk for infection due to their immunosuppression from chemotherapy and radiation therapy. Tissue expander surgeries may result in complications that can often result in extended antibiotic treatment, increasing the rate of drug-related complications, and removal of the tissue implant. 1. Cicilioni,OrlandoJ.,VanBrandonFoles,BarrySieger,andKellyMusselman. "Mycobacterium Fortuitum Infection following Reconstructive Breast Surgery: Differentiation from Classically Described Red Breast Syndrome." 2013. PMCID4174052. 2. FromantinI,SeyerD,WatsonS,etal.Bacterialflorasandbiofilmsofmalignant wounds associated with breast cancers. J Clin Microbiol. 2013;51(10):3368-73. Paula Velez, and John N. Greene. "Breast Wound Infections with Rapidly Growing Mycobacteria following Cancer Surgery." N.d. MS IDCP-16-05. University of South Florida, Tampa.